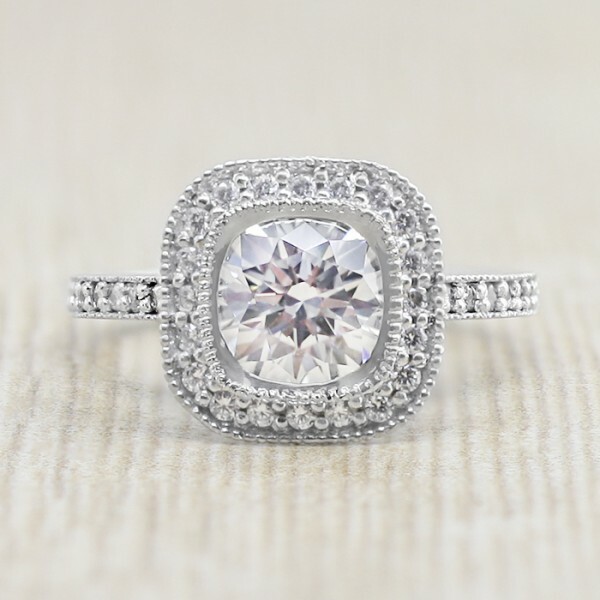 Custom Tiffany Legacy with 1.24 carat Cushion Center - 14k White Gold - Ring Size 6.0 was added to your cart. Inspired by the Tiffany Legacy ring design, this 14k white gold piece features a 1.24 carat Cushion cut center stone in a square halo for an unusual Illusion Box effect. Accents down the sides of the band and mounting bring the ring's total weight to 1.71 carats. Make it your own and show off this one-of-a-kind beauty! Center Stone: 1.24 carat Cushion cut Nexus Diamond, 1.71 total carat weight.